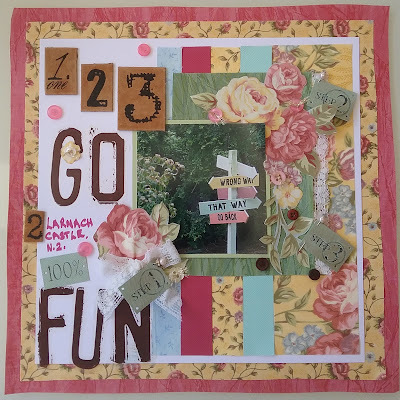 My layout for another challenge over at Scrappingclearly Share & Inspire Group on Facebook. It was hard to select just 5 different colours - I think I managed to get all colours onto my layout. Hidden journalling was the white flower tucked into bottom right of photo. Butterfly bottom right ticked off the adding of an animal - well hope that counts as an animal. See hidden journal tag below. The photo is of my sister in the gardens of Larnach Castle, Dunedin, New Zealand. 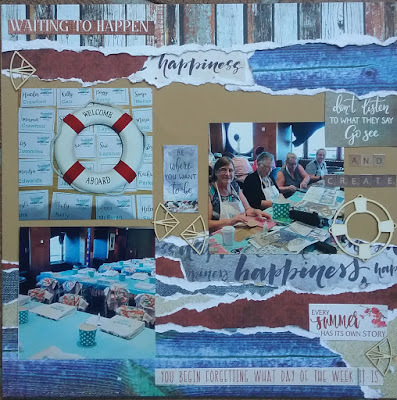 Another layout for a challenge at Scrappingclearly Share & Inspire facebook page. Challenge 6 was 'soft and whimsy'. This photo of my great nephew, celebrating his first Easter this year, is just so adorable. I asked my niece if I could use it for this challenge. When everything was dry I added paper layers, doily,a piece of lacy ribbon and lace remnant to the 100% genuine chipboard embellishment I found in my stash. Finished off with some white gesso through a stencil (I made a whoopsy here - I was heading for the texture paste - and some texture paste coloured with Faded Jeans Oxide Spray. Left over coloured texture paste I covered a chipboard heart and added some more white texture paste for texture. Then I added additional embellishments. I was going to call the layout 'face plant' but thought 100% genuine more like what I was trying to do. Thank you for looking and reading this rather long post. Here is a layout I have created for a challenge over at Scrappingclearly Share & Inspire Group on Facebook. It was challenge No 2 be inspired by Cadbury Colours. I had lunch yesterday with my brother and sister-in-law and they gave me a box of Cadbury Easter eggs to celebrate Easter. I think they shook their heads when I said "take a photo there is a Cadbury colours scrapbooking challenge on!" Here is the box of yumminess. 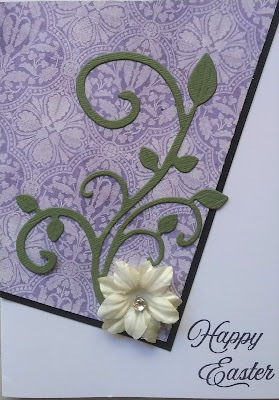 Now, purple is a rarely used colour for me - so off I went in search of purple cardstock and embellishments. The actual packaging I received had lots of hexagons and circles and some purple/mauve so that is the direction I went for my layout. Even, the sequins had a hexagon centre….imagine that I had never seen that on previous uses of these sequins! I did add some gold paint through a circle stencil as well. I added a bit of green to lighten up the page. Look at that sequin you can also see a bit of sponging I did with purple dye ink and the gold paint stencil work I did. Here is a layout I have created using a new Kaszazz collection Flora and Fauna. The stamped and gold embossed sentiment says "It's the friends we meet along the way that help us appreciate the journey." This is a photo of one of my longest lasting friendships. We were in the same year, however not the same class, but surprisingly we never met at school and it was only after we left that we met. Robyn and her husband live in Canberra and over many years I have travelled down or they have travelled up and we have caught up all over again. In March this year I travelled to Canberra and we went to the Arboretum for lunch and a drive around this fabulous place. True friends. Here is a close up of the stamped sentiment also showing the simple machine stitching I did on the layout. Here is the chipboard eucalyptus leaf I have double embossed - that is, I embossed first and when dry I embossed again giving a deeper coverage. All products I have used are available from Kaszazz - yes I am a consultant - with the exception of the sewing machine and thread I used. I hope you like this layout as much as I do. This is a layout I have created for an ad-spiration challenge over at Paper Issues (Friends and Fans) facebook page. What did I draw from this - the water view, the umbrella and on the bottom of the ad the advertising blurb. In my photos from our cruise to New Zealand earlier this year I had this photo of a pier on the sea wall in Napier and when I was looking for photos I was drawn to the similarity of the canopy to the umbrella in the photo. I journaled using my Dylusions Paint Pen in white - I have usually stayed clear of this pen as it can be temperamental in letting ink out of the nib - not today so pleased. This is a clean and simple layout - I have used all products that are available from Kaszazz. I wanted the photo to be the star of the show and so did not go for over embellishment. Thank you for looking, just between you and me I am so chuffed on how this layout turned out. Today, I delved into the world of mixed media again. Here are two tags I made testing out the skills required as I have a larger project in mind. In real life they have a sheen courtesy of Pewter Ranger Distress Spray. Here is what they looked like before I added the spray inks over the gesso. I was inspired by this blog I found whilst looking for ideas. It has been a great starting off point for me. I have used Dylusions Sprays and finished the tag off with a spray of Pewter Ranger Distress Spray. Now I have the confidence to go further with the idea I have in my head. In my previous post I wrote of winning a prize on the Unmistakable Creations cruise I took in January with my sister and friends to New Zealand. Here is a layout I have created using the Paisley Days collection I received. The photo was taken at Larnach Castle, Dunedin, New Zealand and with our friends we are having morning tea in their beautiful tea rooms. Below is a close up of the texture of the background. More on that below. 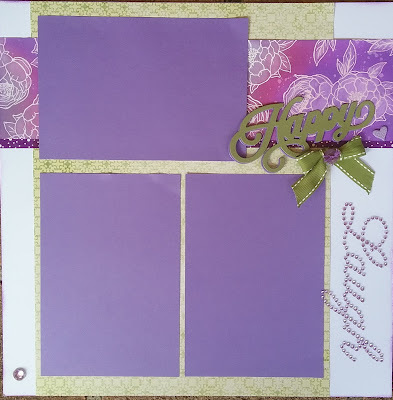 I was inspired by a layout by Lisa Amiet on the Kaisercraft blog. I have left her some love on the blog. I was really taken with the background technique. The background was fussy cut from 12" (30cm) sheet of paper in the pack and smaller pieces adhered with foam tape to create raised surfaces. I have also raised the photo and several of the smaller embellishments. Thank you Lisa. 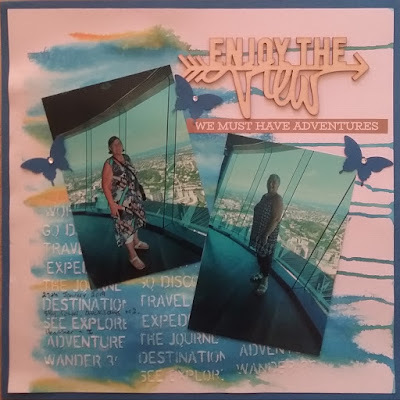 I have decided to add this to a Paper Issues (Friends and Fans) Scraplift Sunday (7th April) Challenge - check them out and join the group for challenges. Here is the layout that we were to inspired by. Not quite the same but there are lots of flowers on my layout. Thank you for looking, Margaret. 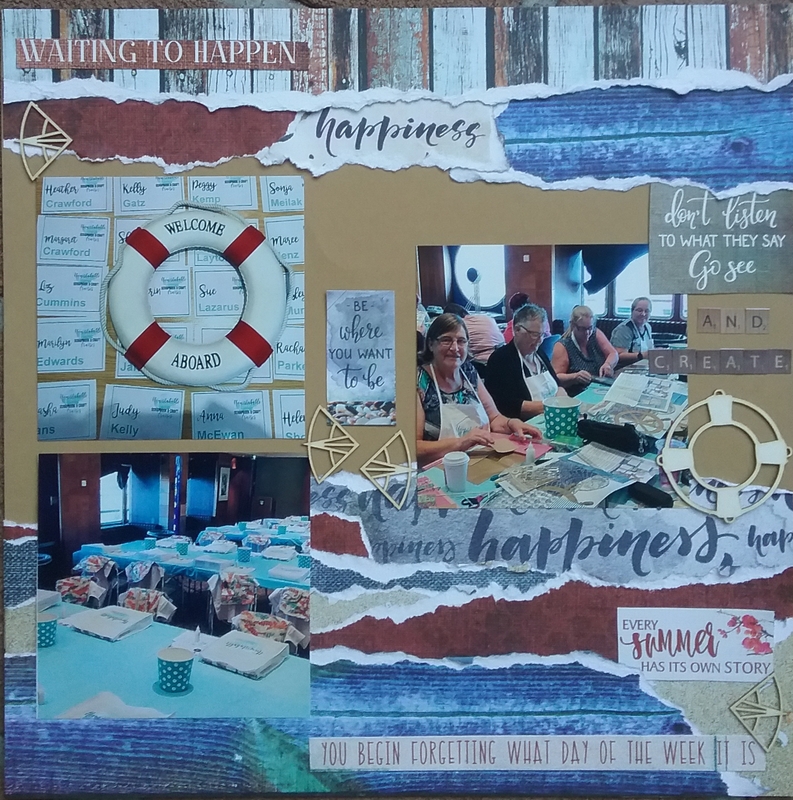 On the scrapbooking cruise in January, to New Zealand there was a prize pack given away of Kaisercraft Sample Pack that contained samples of quarter releases of new collections. It contains Rosabella, Paradise Found, Breath, Green House, Two Souls and Paisley Days releases. Does not include Clear Stamps, Dies and full paper packs. I let my sister, who was on the cruise with me, to choose one pack for herself - she chose Two Souls and she loved the colours and lacy patterns in this collection. My next post will show a layout from the Paisley Days release. Thank you so much to Melissa Kennedy of Unmistakable Creations (and her husband who pulled my name out of the hat) for this generous prize. What I hear you say is Background Noise? It could be background created with paints/inks/stamps or maybe using a busy background as the base of your layout. I had these 3 photos from the Unmistakeable Creations scrapbooking cruise my sister & I were on to New Zealand in January this year. The photos on the left were before classes began, all set ready to go, nice and neat! The photo on the right we were busy and well into scrapping on one of the at sea days!! I have used leftover Penelope Dee range Summer Breeze (that I used on a previous cruise) torn and distressed. The chipboard are actually leftovers from Celebr8 range Set Sail that we are using in the photo on the right! This is a card I have designed for the class I lead at a local community group - this is for the upcoming Friday class. I decided to recognize my growth in the 10 years and updated the card design. I have used a new released Kaszazz stamps - Flowering Gun Un-Cut Set that has 3 images and the greeting is also Kaszazz from Mini Message - Notes. A little more texture this time around. The 2009 card was sent to friends in US and I think I will send them the new version after the class as well. I lead a community card class each Friday during school terms. With Easter approaching I asked my ladies (there are no men attending) did they want to make an Easter Card. Yes, BUT they did not want bunnies, chickens, eggs, yellow, pastel colours etc. So I came up with this card - they loved it. I found the design on Pinterest - it is a great way to use up scraps of paper. This card is going onto an Easter card challenge on Soul Scrappers. Thank you for looking, Margaret. You must use one or more things from each item. Or use a new tool you are yet to try out. Here is a photo of my before items......I went deep into the bowels of my stash for these! 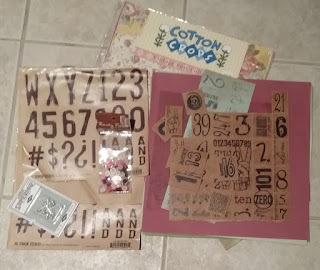 There are 12" square fabric sheets (some sheets had been used as there are scraps in the pack); remnants of a Club Scrap kit from February 2006; Big Honking stickers; Rusty Pickle buttons unopened; Shell stick pins from Jenni Bowlin, also unopened. With the exception of Club Scrap remnants how long I have had the rest is anyone's guess. I have used the fabric paper for first 2 layers - the fabric paper was not square I just went with it. I have also fussy cut several of the flowers from the fabric paper and used it for strips as well. The coloured cardstock (CS) came from Club Scrap Kit as did the numbers and little signs. The reminder of stash I selected can be seen on the layout. I did add a bit of lace, gold thread through the buttons and white CS and an alcohol pen to write name Lanarch Castle. I was fascinated by the sign, in my photo, within the beautiful gardens of Lanarch Castle in Dunedin, New Zealand. A great place to visit. I loved that it reminded me of travelling you sometimes never where the road will lead, especially if you take the wrong road there are adventures and fun to be had. This layout was way out of my usual style nevertheless I had FUN. Here is a mixed media A4 canvas I finished yesterday. 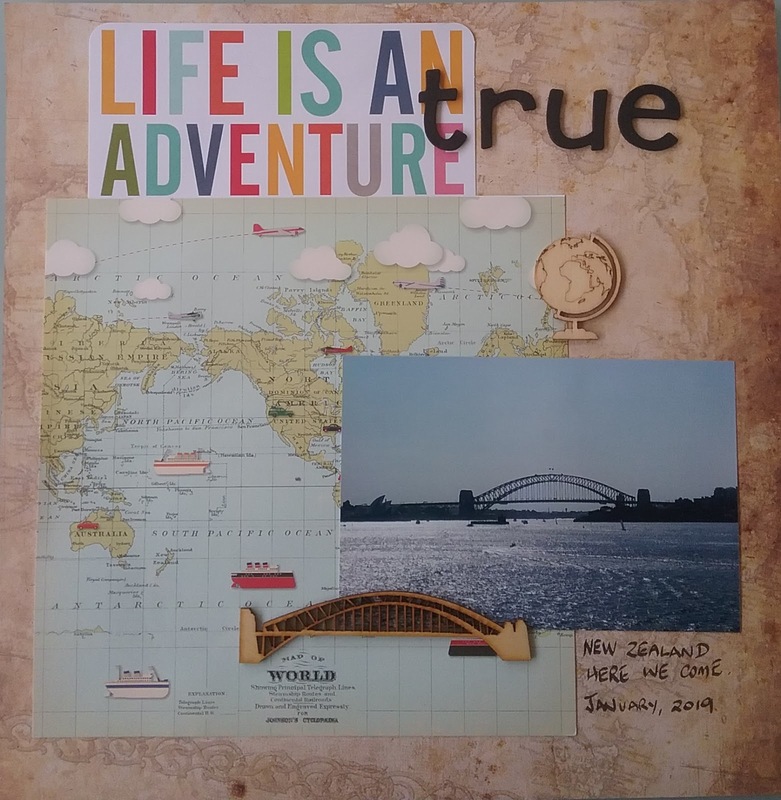 The canvas was designed by Melissa Kennedy and instructions were provided on our Unmistakeable Creations cruise to New Zealand in January... yes I have just got around to starting and completing it. Such fun to play with the techniques used. 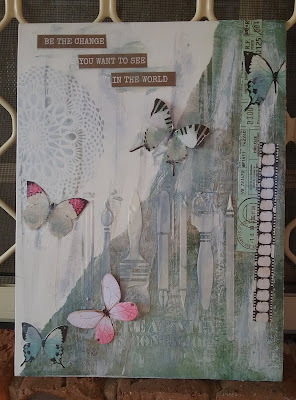 All products (except canvas) are from Kaisercraft - Scrap Studio collection papers and stencils. 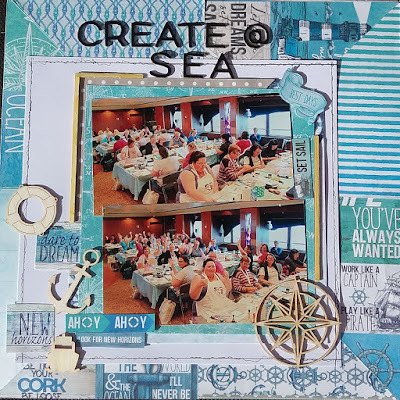 Interested in doing a cruise, Melissa is the owner of Unmistakeable Creations and has cruises covering scrapbooking, cardmaking and patchwork. Check out her link. 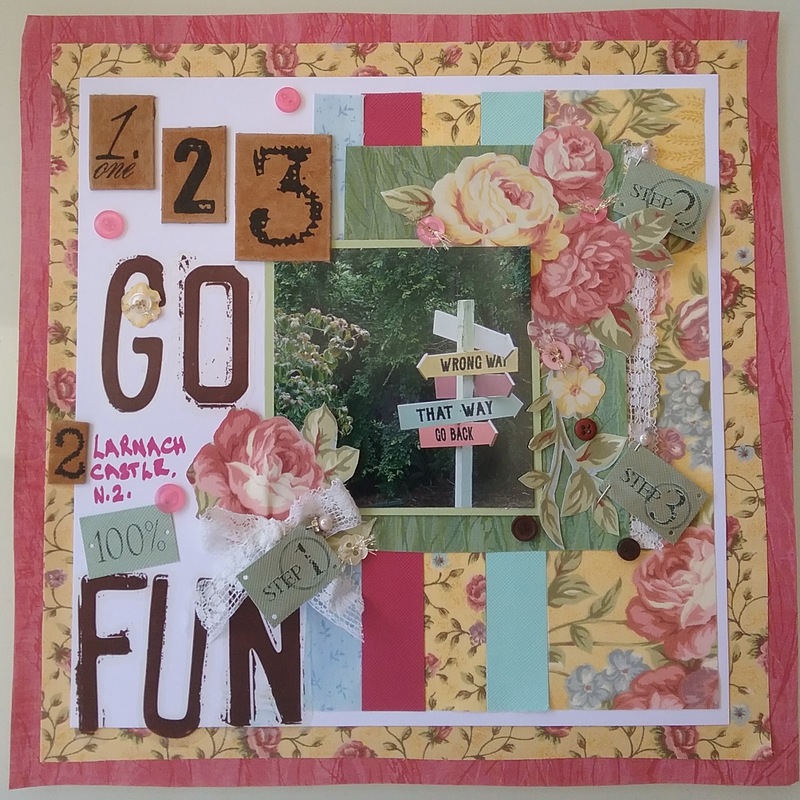 Over at Paper Issues (Friends and Fans) Facebook page there is a challenge every Sunday called Scraplift Sunday. The idea is to draw inspiration from the layout and create your own. And here is my take on the layout from 18th March. 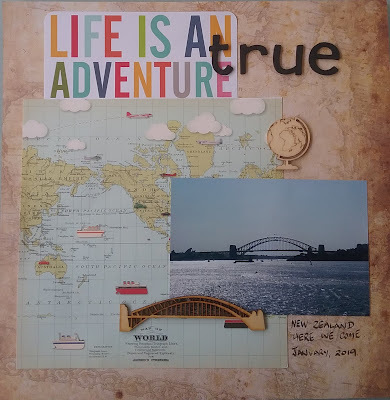 I was firstly inspired by the word 'create' and then sought out photos of our class on board Radiance of the Seas in January, 2019 when my sister and I were on a scrapbook cruise to New Zealand. 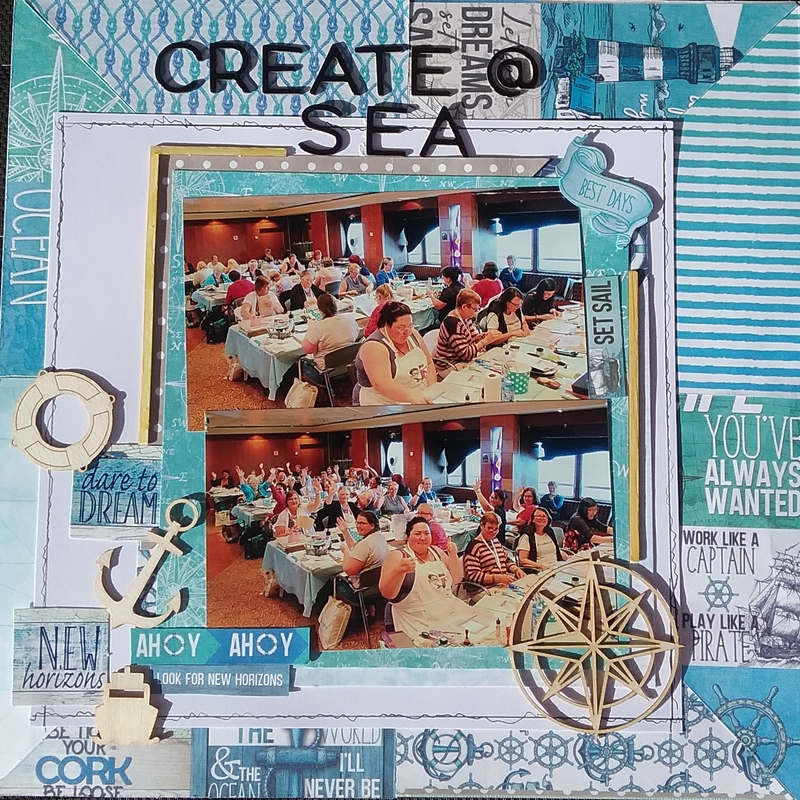 These photos are of all of us creating in one of our classes at sea. I have used papers and embellishments (except alphas and little ship bottom left) from Set Sail collection from Celebr8. I used up the leftovers from the kit received on this cruise. The photos were taken by Melissa Kennedy, teacher and owner of Unmistakeable Creations. Why not check out both Paper Issues for layout inspirations and Unmistakeable Creations for future cruises. I have designed this card for ladies I lead at local community group on Fridays. This is called a diorama card - I headed to Google and searched. There are many sites and videos out there that provide information on how to make them. Jennifer McGuire has information - just click on her name to discover her wonderful cards made using this fancy fold. All stamps (except for the greeting stamps) are from Kaszazz. For my card I attached a little 3" square card to the back - this also provides and easel if the recipient wants to display card as well as the sender writing their special greetings. By the way, I did also Google "colours of turtles" and found there was a rainbow turtle - so that is what I went with on my card - lots of opportunities for the ladies to use the coloured pencils. A clean and simple layout today. The journalling tells my story. Use a circle. Yes those enamel dots. Use an avocado. We grow these in Australia. Here is my layout for Day 8...yes skipped Day 7 will get back to it! Use machine stitching. I stitched down to highlight wood panels and also stitched journalling lines. Use paint. I used Dylusions White Linen and a dry brush to tone down the colours. The paint on title I applied with my finger. Use a number in your title....6 Kids. Probably called children in those days but did not have enough alphas to go around. 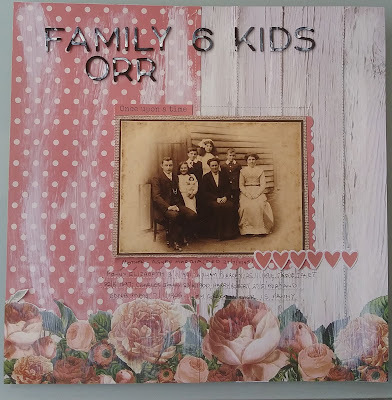 Covered a mistake ....I really messed up writing the mother's (my great-grandmother) name....so added another border punch strip.. Here is the proof. On this close up you can see Will Piercey (know as Piercey) has a bandage on one finger! I have done some research on him and he apparently put his age down to join the WW1 as a photographer. The photo is of my grandmother, far right with her mother and other siblings. I would say the photo was taken in their home in Strathfield NSW. I went to the old family bible and all their birthdates were there. My grandmother was the oldest child. My grandmother was known as Jessie, now that would have been confusing as she had a sister called Jessie. I don't know when the photo was taken, as it is not recorded on the photo, but I would say she is a teenager in this photo. You don't stumble upon your heritage. It's there, just waiting to be explored and shared. Robbie Robertson. Now a photo of what I was sent. I was to try and use as many items on my creation as I could, and could change the items by painting, embossing, colouring in etc. The burlap (called hessian in Australia) banner had to be decorated. Well, I managed to use everything in my envelope. Yes, there was some colouring with ink to tone down the images to fit with the overall colour scheme - particularly the owl and the leaves. I removed the backing from the banner so that I could distress the edge and I also distressed the edges of the fabric I received. In my stash I just happened to have some left over papers from the Kaisercraft range Outdoor Trail collection that fitted in perfectly for this challenge. The photo was taken in April, 2018 when my sister and I visited New Zealand - Haruru Falls Scenic Walk - I did a very short section of the walk. Here is my layout for Day 6. Use graph paper. Searched my stash no graph paper what's the bet I find some tonight! Use pocket card on non pocket layout. I used the pocket card for part of my title. Use citrus fruit! Another what the moment! Title with 5 words. Added true to pocket card. Use a hedgehog! Don't look you won't find one! Use a sketch. I found a single layout I like at organized and creative mom. Thank you for your inspiration Noreen. I have left thanks on your blog. This sketch was the inspiration. Use watercolour. I have used a technique I recently used on cards - white embossed with Peony stamp, distress oxides applied and then watercoloured with waterbrush. 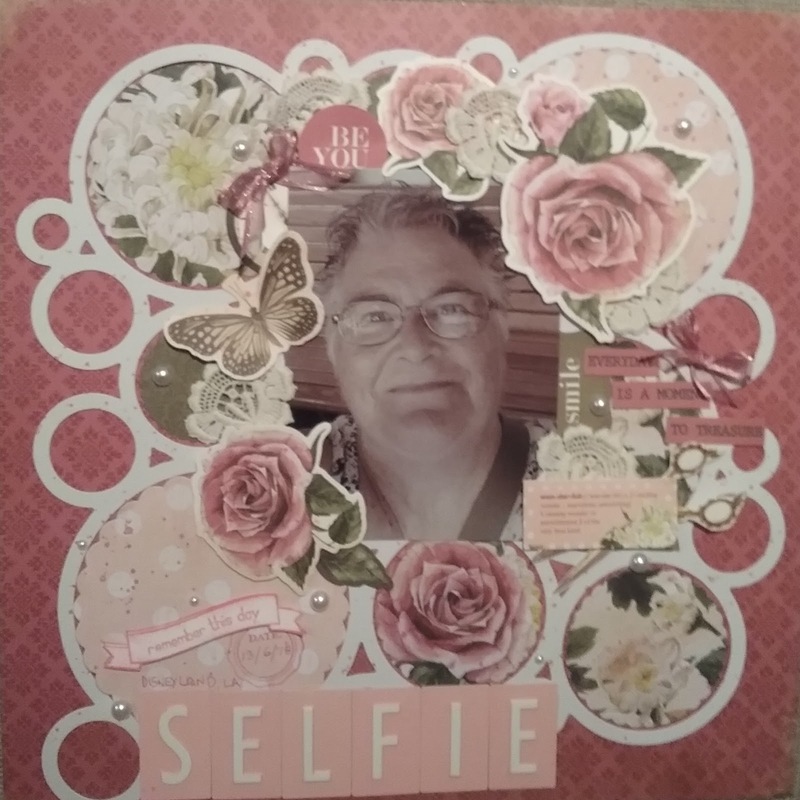 I was showing some friends my cards - and they loved the technique but how could we use it for scrapbooking - this is what I have come up with it. That border was a perfect way to incorporate it! I will show them this week. I can see a workshop coming up! Use the colour purple. Sounded fair enough - complete layout and I will find photos this morning! Something old from your stash. That 'laugh' bling has been with me for years - it says 'Michaels' we do not have a Michaels here in Australia so I probably picked it up years ago on one of my visits to the US. It has stared at me for years as I pass it sitting in a basket on my way into my lounge from the garage! I have no suitable photos in my considerable number of them for this layout! I think a visit to a lavender farm is in order! I am heading to Canberra, ACT shortly and google has told me there is a lavender farm not far from there - guess where I am heading! I have more portrait orientation photos than landscape. Message to self - take more landscape photos - that lavender farm is looking good! The papers, happy die cut and Oxide Inks are available from Kaszazz everything else from my stash. It is no shock to know that pink is my favourite colour .... all shades. Use memorabilia. I have used pieces of guipure lace that belonged to my mother, they are many years old as she passed away at a very young age, only 49. She was a tailoress/dressmaker and I have put in a die cut pair of scissors to recognise this. Use a stamp. I used 3 stamps ... 2 bottom left and grunge spots thoughout the layout. Use a black and white photo. The selfie photo was taken at Disneyland, LA last year as I rode the train around the park in very hot weather. If you look closely I printed it with a slight hue to co-ordinate with papers I chose. Hope this is acceptable. Print or put away 5 layouts. Done, put into album the layouts I designed for weekend fund raiser and others just sitting around. Use an animal print! What the! Not appropriate for this layout. Use a selfie. I never seem to take a good selfie but this one made me happy. Use an avocado! Another what the moment! From the previous challenges I used and this is allowed. Cut File. 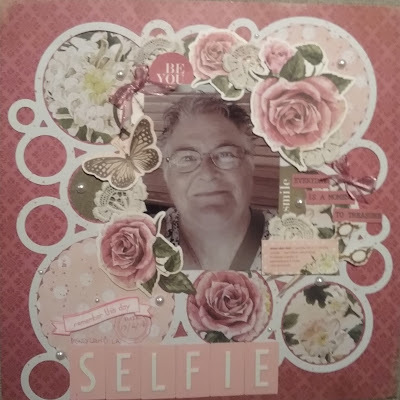 I used a Kaisercraft circles. Use an old product. I can't tell you how long those making memories perfect pink alphas have sat unused and covered in dust when I got them out. The Kaisercraft Confetti stamps years old. Papers and collectables are from Kaisercraft Treasured Moments collection. Head over to ScrapHappy and join up why don't you. I found ScrapHappy website and each March they have a Calvinball challenge all month. So, I signed up and I have completed this layout for Day 3. You can accumulate points during the challenges. Check out the link above for more information and also how the name Calvinball came about. Use wood veneer. I used a Heidi Swapp "Enjoy the view" that I purchased from USA, reduced of course to $1.49 US, last year. Use a stencil. Tim Holtz stencil and texture paste. Create your own patterned paper. I used Distress Oxides and sprayed with water and let it run. I will admit to an ooops moment, placed next to my water mister was stamp cleaner bottle....I accidently sprayed that on second spraying, no worries let it stay did the same! Use your own handwriting/or a handwriting font. Bottom left corner I have recorded the date my sister and I went up the Sky Tower in Auckland in January. Great views on the day. Use a butterfly. Why not they fly and we would have jumped out of our skins if we did in fact see one so far up! Use a sticker. Of course we must have adventures, Kaisercraft sticker from my stash. Fun layout. Now to get to do Day 1 and 2 and await Day 4. Distress Oxides are the best! I must admit I love Distress Oxides, they are beautiful colours and they blend so well together. Here are cards I made with my local community group last Friday. 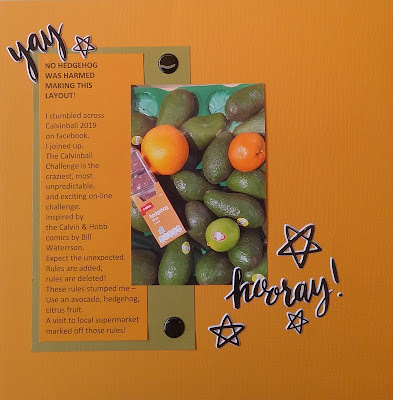 This card uses spiced pumpkin and mustard seed distress oxide inks. 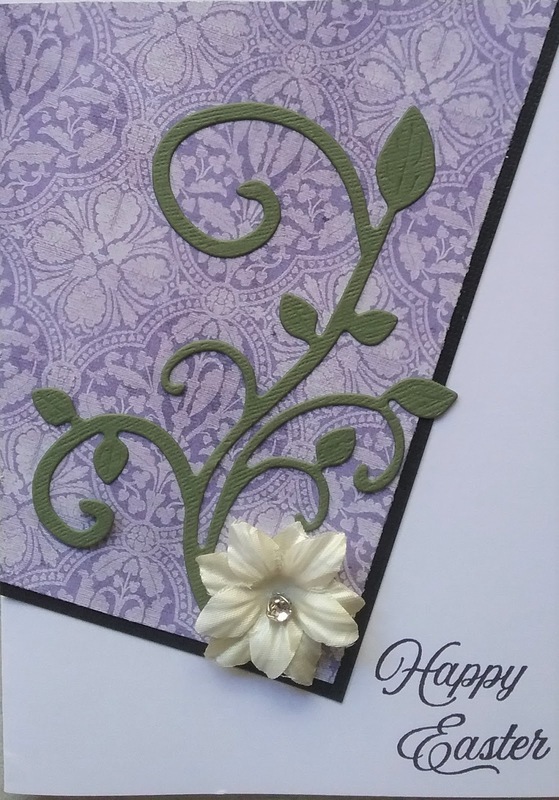 This card uses picked raspberry and wilted violet distress oxide inks. Both cards use stamps available from Kaszazz - Peonies and Happy Day Messages. Yes, I am a consultant and I just love that this is an Australian company and has great stamps and papers that I get to use. I was inspired by a video over at Jennifer McGuire on Distress Oxide Water Painting. Thank you Jennifer for inspiring me. I have left her some thanks on her blog - check the link and check out her blog for great projects. Thank you for looking, happy creating, Margaret. Today, I led scrapbooking classes locally, to raise funds for Mango Tree Academy in Kissi, Kenya. 12 ladies came and they made two double page layouts that I designed especially for the day. This layout uses Serendipity range of papers available from Kaszazz - all embellishments are also from Kaszazz. I have yet to add my photos. The chipboard was first painted with gesso and then stamp ink applied and finally Glossy Accents added for that extra sheen. 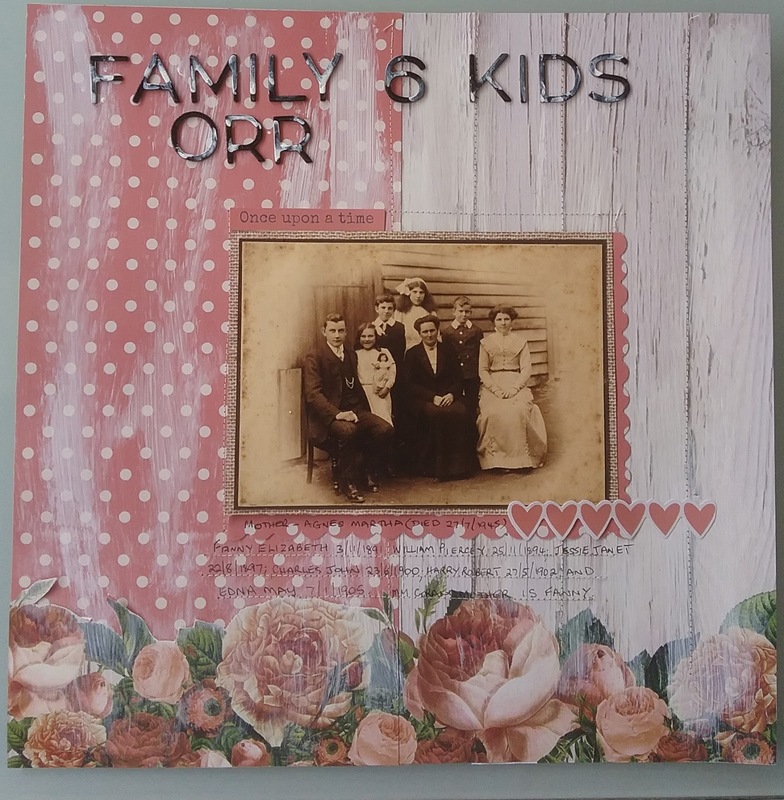 This layout again uses paper and chipboard embellishments available from Kaszazz. There are two papers not Kaszazz - corrugated orange on bottom and the solid orange squares. Die cuts of Koala, gum leaves and words are by other suppliers. Both these layouts were designed for multiple photos something that the ladies have requested in the past. A great day was had and funds raised to give back to others.